The gravitation of Magritte, Dali’s antigravity. Simple aggregated forms of constellation, Lee Krasner’s repletion. 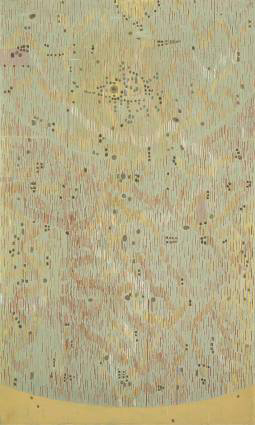 Woman at the Western Window (1957, in the collection of a law firm) proceeds from ukiyo-e to Gustav Klimt, and from a distance the initiative might be Olive Oyl’s. Clyfford Still or Lorser Feitelson or a Navajo rug or Van Gogh in a puzzle or African totemic vignette or all of these and Sam Francis too in Whistler’s Peacock Rooms? Fischinger? Klee? Sun of Oklahoma (Indian Territory). He understands the necessary forms, or rather the necessary indications of necessary forms, early on. In 1972, he anticipates Bridget Riley’s lozenges of the Nineties (Untitled, in the collection of Luchita Mullican).